August 27, 2015 - Boeing announced today the completion of the firm configuration milestone for the 777-9, the first member of the 777X family to be developed. The Boeing 777X team reached this significant design milestone after working closely with airline customers and key suppliers to optimize the configuration of the new airplane. The 777X family includes the 777-8 and the 777-9 both designed to respond to market needs and customer preferences. The 777-8 and 777-9 provide significant range, payload and fuel burn advantages compared to the A350. The 777X will be the largest and most efficient twin-engine jet in the world, with 12 percent lower fuel consumption and 10 percent lower operating costs than the competition. 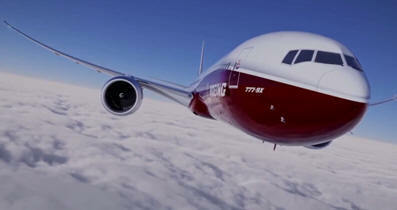 In addition, the 777X will bring cabin innovations and improved levels of passenger comfort. The 777X program has received orders and commitments for 320 airplanes from six customers worldwide. Production is set to begin in 2017.